We can only envision her from the back. She is a lovely vision of the beauty of the heavens, covered in stars and a slice of the moon. She hold her hands above her head as if in praise of the universe. 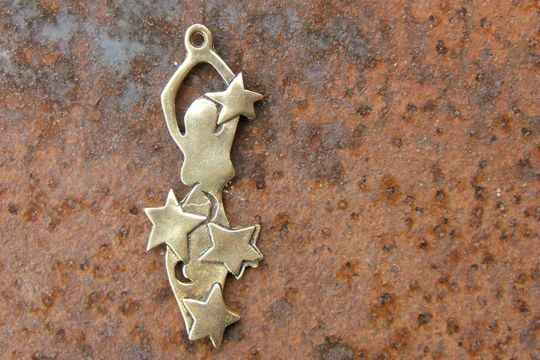 This striking pendant or charm was designed by an artist from the west coast and rendered in golden bronze. The charm or pendant measures 2 inches high (including the hanging loop) by 3/4 inch wide.